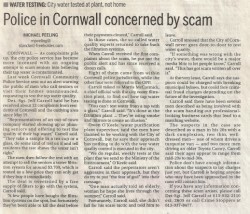 Police in Cornwall concerned by scam - 1000 Islands Water Treatment & Plumbing Inc. : 1000 Islands Water Treatment & Plumbing Inc.
Cornwall – As complaints pile up, the city police service has become more incensed with an ongoing attempt to scam seniors into believing’ their tap water is contaminated. Last week Cornwall Community Police Service sent out an alert warning the public of men who call seniors or visit their homes unannounced, requesting to test the tap water quality. Det.-Sgt. Jeff Carroll said he has received about 12 complaints from residents of Cornwall and the outlying area since May 19. The men then follow the test with an attempt to sell the seniors a water filtration system for around $3,700,which is touted as a low-price they can only get if they buy it immediately. The deal is sweetened by a free supply of filters to go with the system, Carroll said. “A few people have bought the filtration systems on the spot, but fortunately they’ve been able to kill the deal beforetheir payments cleared;’ Carroll said. In those cases, the so-called water quality experts returned to take back the filtration systems. Eight of them came from within Cornwall police jurisdiction, while the other four were referred to the OPP. Carroll talked to Morris McCormick, a chief official with the city water filtration plant, to find out how tap water testing is done in Cornwall. Owen O’Keefe, water purification plant supervisor, said the men have claimed to be working with the City of Cornwall, but he says their approach has nothing to do with the way water quality control is executed in the city. “We do regular, weekly tests at the plant that we send to the Ministry of the Environment;’ O’Keefe said. Carroll said the perpetrators aren’t aggressive in their approach, but they do try to put “the fear of god” into their message. .
“One man actually told an elderly woman he hope she lives through the summer;’ Carroll said. Fortunately, Carroll said, she didn’t fall for his scare tactic and told him to leave. Carroll stressed that the City of Cornwall never goes door-to-door to test water quality. At the-very least, Carroll says the suspects could be charged with breaking municipal bylaws, but could face criminal fraud charges depending on the future of the investigation. Carroll said there have been several men described as being involved with the scam handing out professional- looking business cards that lead to a matching website. The suspects in the case are described’ as a man in his 20s with a dark complexion, two thin, well-dressed men -one of whom drives a turquoise van – and two more men driving an older Toyota Camry. Carroll said their ages appear to range from mid-20s to mid-30s. Police don’t have enough information about the suspects to lay charges just yet, but Carroll is hoping anyone who may have been approached by the men will contact him. If you have any. Information concerning these scam artists, please call Det-Sgt. Jeff Carroll at 613-932-2110 ext. 2605 or call Crime Stoppers at 613-937-8477.